Emily Carr has always had a double audience: one for her painting, and the second for her writing. This little book is a collection of sixty very short stories – really sketches – which Carr put together because she thought they “ornamented life, which would be a drab affair without the little things we do not even notice or think of at the time…”. She originally called the collection Hundreds and Thousands, after the tiny coloured candies sprinkled over birthday cakes. For the last thirty years they have been in the British Columbia Archives. Scholar Ann-Lee Switzer has studied Carr’s writings for some years and in fact lives near the Archives in Victoria. The jottings were done by Carr in the last two years of her life. She had already published three collections of her stories: Klee Wyck (1941), The Book of Small (1942), and The House of All Sorts (1944). Her great mentor was Ira Dilworth, professor of English at the University of British Columbia, and later director of the Vancouver branch of the Canadian Broadcasting Corporation. They shared a love of poetry, and of the Canadian West. 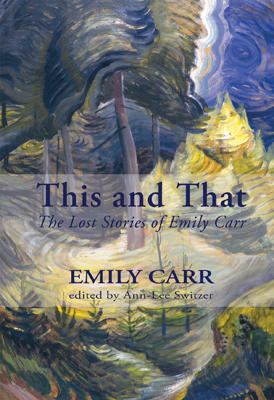 These stories are intimate, funny, and show the sharp sensitivity that we have always loved in Emily Carr’s paintings.